This water kettle (hibachi) and bamboo water scoop set is one of the Miss Kyoto doll accessories. 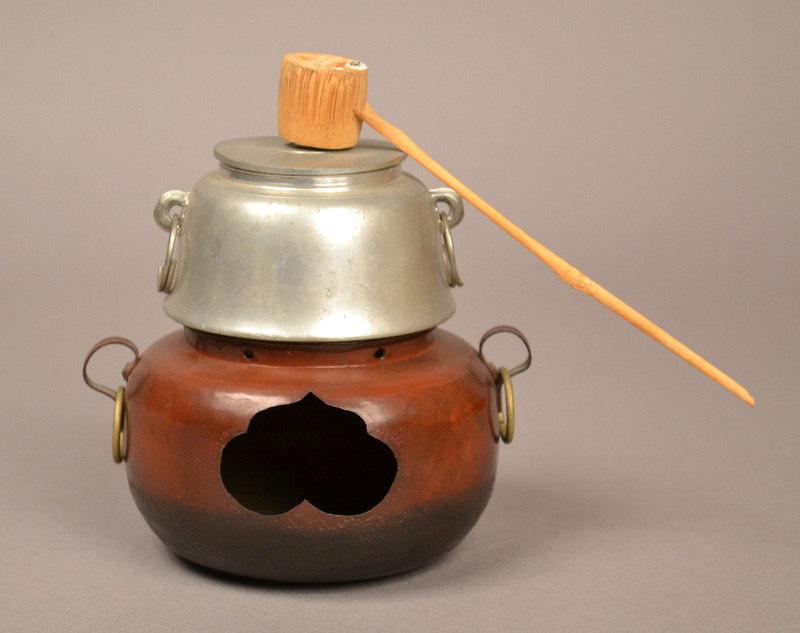 The set is a miniature of the kind of set used to heat water for tea during a tea ceremony. The metal hibachi (brazier) is round and brown, with a blackened incised base. There is a hole in the top and a globular cutout on one side; it has two handles, each hung with a brass ring. The top rim is pierced with tiny holes. The water kettle, also made of metal, is silver colored. The kettle is comprised of two pieces: a base and a lid. There are two small handles, each hung with tin rings. The kettle is round and flared at the bottom, where its inset base fits into the top of the hibachi. The ladle, called a hishaku, is made of bamboo, and has a round scoop mounted on a long handle. A hibachi (literally "fire bowl") is a traditional heating device from Japan dating to at least the Heian period (798-1185). A typical hibachi is either round or box-shaped, hollow with an open top to hold burning charcoal. They were primarily used for heating, though occasionally for other purposes (as a cigarette lighter or portable stove) as well. The tea ceremony is a tea-making ritual from Japan (practiced less frequently in China and Korea). At a very basic level, tea ceremonies are a formalized way of making a hot drink through a process that has been refined to yield the best taste. In Japanese, the tea ceremony is referred to as the chado, literally "the Way of Tea," or cha-no-yu ("tea water"). In keeping with this Way of Tea, in the ceremony, tea essentially becomes more than just a drink: the tea ceremony is understood and practiced to foster harmony in humanity and with nature, and to discipline the mind, quiet the heart, and attain the purity of enlightenment.